The king is dead, long live the king! I dubbed our last selection in the series as the best of the bunch to that point, and so it was. Meet the new champ, the beer formerly known as Winter YuleSmith. Not by much, mind you, but if we were last primarily in the land of malt, the compass needle flips to the hop side with this one, and the “double” load of aromatic hops won me over. 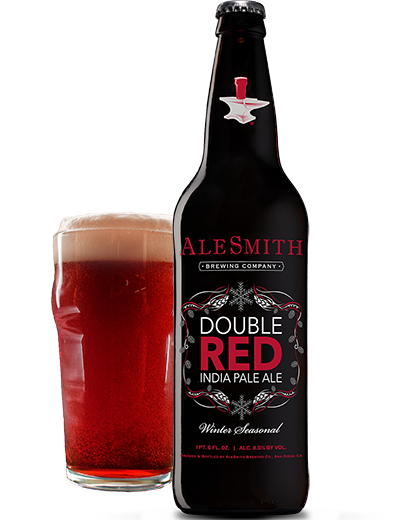 I’m not sure why AleSmith decided it needed to rename the beer Double Red India Pale Ale, but it’s the same beer, we’re told, that they’ve been brewing since 1996. It says “Winter Seasonal” right on the label, along with images of a few snowflakes, should one need further convincing. The beer itself looks as aesthetically pleasing as it tastes, deep amber with a roseate glow. And the nose is pretty fruity, if not quite like a cherry. AleSmith is a little tight-lipped about what hops it uses beyond “American hops” but I’m thinking some of the “C” hops are a good bet—Cascade, Columbus, Centennial and/or Chinook, with the swirl of resin and grapefruit citrus on hand, with a touch of black currant. All this hop perfume is then washed over by a sweet, velvety, caramel-malt rich palate that blends perfectly. It glides into a subtle finishing bite with little heat, and little suggestion of the strength at hand. I can’t say I’m sorry no one was around to share this bomber bottle with me. But I did take my time with it before, during and after dinner, and it served well in each function. The brewers suggest the beer will go well with “succulent roasts and hearty stews” and I lucked out there, too, as my wife had returned from a day at Wildwood Barbeque and returned with a favorite, the house-smoked Brisket Shepherd’s Pie. I think “succulent” is the key word here. 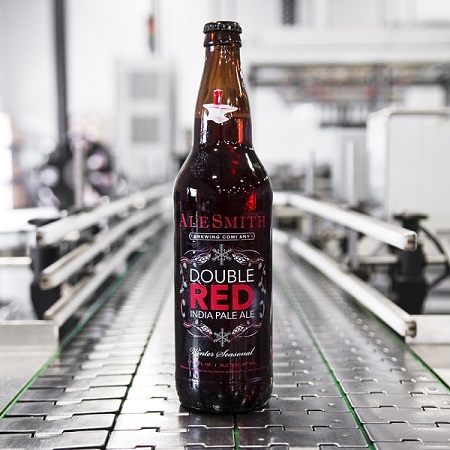 A great beer from AleSmith shouldn’t come as a startling surprise. The San Diego brewery has been churning out prize-winning beers for 20 years now. The pleasing surprise is the ease with which the brews are now found in Vermont (and 16 other states for the year-round offerings like Anvil ESB), thanks to the company’s recent expansion—one might call it a leap—into a new brewing space. That includes what is said to be the largest tasting room in San Diego, which is saying something, since I was just out in San Diego and it’s difficult to imagine a tasting room larger than the space at the Stone Brewing Co. I didn’t make it to AleSmith this time, but did visit five years and met brewer and owner Peter Zien in the compact, bursting-at-the-seams brewery, which maxed out capacity at 15,000 barrels a year. 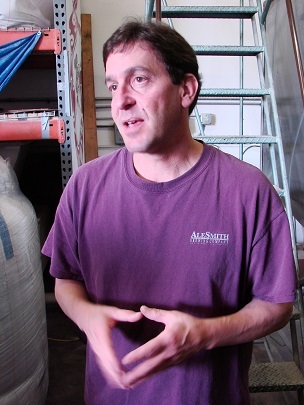 The new brewing space has a 250,000 barrel capacity, though it will be years before AleSmith grows to that extant. Back in 2010 Zien said, “We did 106 batches last year. I don’t see us getting much bigger.” So he’s not a fortune-teller. He considers himself a craftsman, an artisan—“I love brewing because it’s a blend of art and science”—and spent as much time talking about cheese-making as brewing and his hopes to start a cheese company. Five years later CheeseSmith products have made nascent appearances at tastings around San Diego, and the venture will eventually be incorporated into the new space. Availability: November-December, AZ, CA, CO, CT, IL, MA, MN, NY, OH, OR, VA, VT, WA. Iceland Golf: Have You Driven A Fjord Lately?